Health professionals across London today have access to a brand new, online Atrial Fibrillation (AF) Toolkit, improving the detection and treatment for the estimated 68,000 people in the capital at risk of an AF-related stroke. The Atrial Fibrillation Toolkit has been designed by a team of experts, including the Health Innovation Network, to help address one of the biggest burdens on the NHS and the health of the population. It brings together the latest clinical guidance, performance data, case studies and support for clinicians and commissioners. Atrial Fibrillation (AF) is the most common cardiac arrhythmia and is a major risk factor for stroke; contributing to 1 in 5 strokes and associated with a 20% increased likelihood of mortality. An estimated 68,000 people in London are living with undetected AF and at risk of blood clots, stroke, heart failure and other heart-related complications. The risk of a stroke for people with AF can be substantially reduced by detecting and diagnosing the condition, and providing effective anticoagulation to prevent the formation of clots in the heart. Despite this, up to 25% of known people diagnosed with AF are not appropriately anticoagulated. Aside from the clinical risks, it is estimated that stroke care costs the NHS £2.8 billion in direct care each year. • Anticoagulation adherence support for patients. 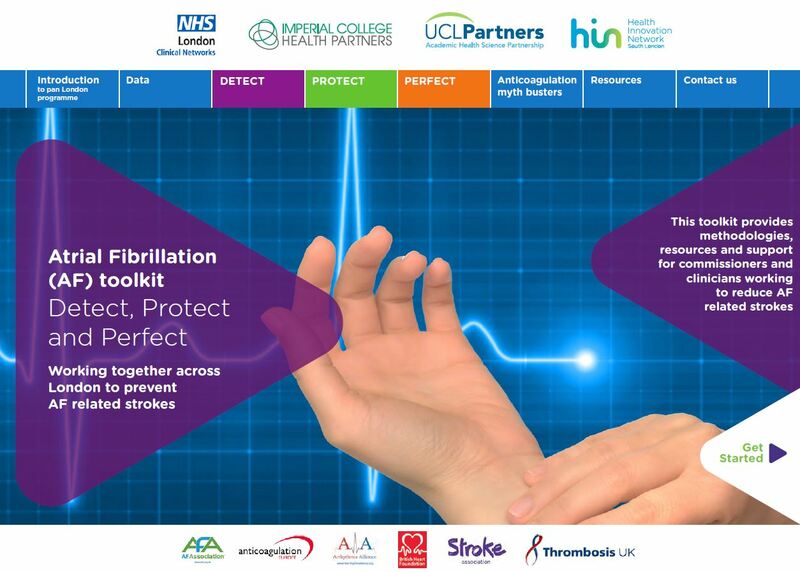 Partner organisations in London are working with colleagues through the AHSN Network to make the Atrial Fibrillation Toolkit available to healthcare professionals, commissioners and clinical networks across the county. It can be downloaded here http://bit.ly/london-af. The toolkit has been a collaboration of the three London Academic Health Science Networks (Health Innovation Network, Imperial College Health Partners and UCLPartners), the London Clinical Networks and charities. The partnership seeks to avoid the debilitating effect of strokes by detecting AF and treating people using evidence-based innovations, whilst also making savings within the NHS and social care.